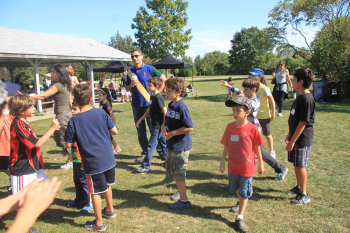 The LAU Alumni Association Toronto Chapter held a picnic on Sunday September 11, 2011 in Etobicoke Centennial Park. Around 110 people attended this event. Delicious food was seved, BBQ (Chicken, Kafta), hummus, taboule, salads, namoura, cake, etc… Dr. Joseph Jabbra and Ed Shiner were the guests of honor. Dr. Jabbra gave an update on LAU recent achievements and future development plans. The day was full of fun activities for the adults and the kids including soccer, pinata, balloon popping game, watermelon eating contest, raffle for prizes, and Oud music. Everyone had so much fun!